UC Berkeley students contend that campus budget cuts are devastating the Ethnic Studies Department because it receives fewer private grants. 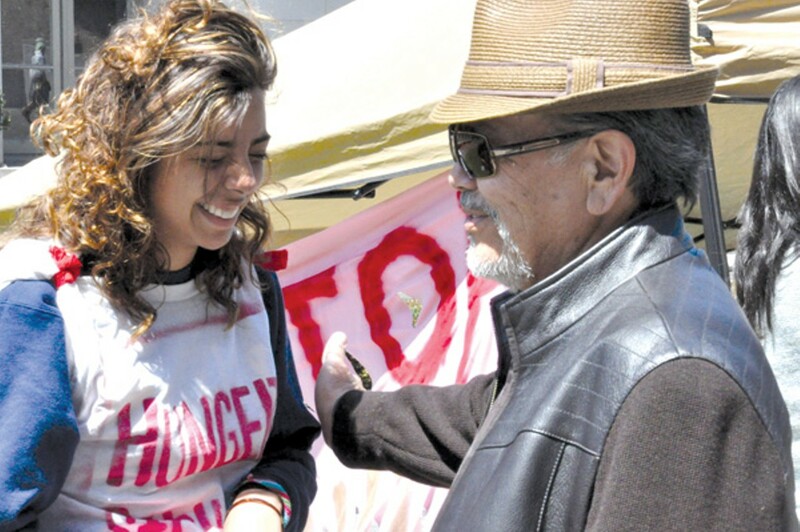 Hunger striker Veronica Rivas and UC Berkeley Ethnic Studies co-founder Carlos Muñoz. Zoila Adaljiza Lara-Cea was sprawled on her stomach on a grassy knoll next to the UC Berkeley's chancellor's office last week under a makeshift shelter spray-painted with the words: "Stop the Cuts to Ethnic Studies." While she crammed for final exams, others engaged in debate with a passerby on the importance of ethnic studies. Lara-Cea and the four other hunger strikers hadn't eaten solid food since April 26 to protest faculty and staff reassignments, layoffs, and reductions in hours in the small UC Berkeley department that grew out of the Third World Strike forty years ago. The university should value the Ethnic Studies Department, just as much as the contributions of the engineering department, said ethnic studies major Cristina Doen, who supports the hunger strike but is not fasting due to medical concerns. "People say, 'We need to build bridges,'" she said. "They don't see [the study of] diversity as a necessity. They say, 'People are racist; that's the way it's always going to be.'" Doen says ethnic studies education can change attitudes. The cuts and reassignments "undermine the mission of who we are," said Carlos Muñoz, emeritus professor and one of the department's founders. Muñoz, who supports the student hunger strike, added that the cuts come at a time when people of color have become the majority in California and ethnic studies therefore has become even "more central to UC's mission as a whole." UC Berkeley spokeswoman Janet Gilmore argued that the Ethnic Studies Department had to face cuts just like all the other departments on campus, given massive state budget cuts and the university's economic constraints. "All units on campus have worked on this effort" resulting in $20 million in savings, Gilmore wrote in an e-mail. "The size of the savings correlated to the size of the school or unit. The larger schools had larger goals and larger plans. And the smaller schools had smaller targets." But Veronica Rivas, one of the hunger-striking students, argued that the impacts of the cuts are not evenly distributed, given that departments such as law and business receive large private gifts. "Public funds are more crucial to my department," she explained. The recent cuts and reassignments of the equivalent of 2.5 staff come on top of the retirement of two faculty members who were not replaced, Muñoz said. Doen added that the Ethnic Studies Department is so small that the loss of even one faculty member impacts the entire program. "I look at the class schedule every semester and say, 'I need this class,' and the class is not being offered," she said. Gilmore pointed out that the university has reduced some staff hours to 50 percent rather than laying people off, and has placed or is trying to place other staff in positions elsewhere on the campus. And UC administrators in a May 4 letter to the students said they would add hours for mentorship by reducing faculty teaching loads, because students had told them mentorship was important. "The courses that the faculty are relieved of would be replaced by the dean," the letter said. But the students argue that experts in their fields should continue teaching courses and that shifting faculty to do jobs they're not familiar with doesn't make sense. They further contend that staff that remain in the Ethnic Studies Department with fewer hours will likely leave the university as soon as they can find other full-time employment. Rivas praised the ethnic studies staff who, she said, go beyond what's normally expected, making sure students feel safe in the impersonal climate of UC Berkeley. "They help me, advise me," she said. "They care about where my education is going. Without them, who will help me?" Lara-Cea, a third-year student in Native American Studies, likened the reductions and shifting of staff to a car without wheels. "The car is still there, so you can argue that it's functioning," she said. "The motor still runs, everything still works, but it will not move. Without the staff, the car will not move." Many of the students on strike and their supporters said they came to the Ethnic Studies Department for personal reasons. Born in San Jose to Vietnamese refugee parents, Doen said she grew up in an atmosphere where she was under pressure to assimilate and never learned to speak her parents' language. At school, the other children teased her for being Asian. "I hated the Vietnamese side of myself for so long," she said. "Ethnic studies helped me find the love I have for my identity." She said she hopes to use what she's learning in her classes to empower her community and other ethnic communities. Victoria Ayala, one of the hunger strikers, grew up in Watts in Los Angeles and said she's still working to overcome the deficiencies in the education she received there. Like the others who are fasting, she said she's getting used to not eating, but she's tired and it's hard just to walk across campus or carry a backpack. "I feel like I'm becoming weaker," she said. "But I'm not letting it affect me, because I'm still here and fasting and I'll be here as long as I have to be." The city is trying to foreclose on a rat-infested vacant lot that's been a point of contention between two record store owners. Three Berkeley clinics have been successfully treating substance abusers with acupcunture - though city funding cuts have hurt two of the programs.